HWg-Juno is a product line designed for I/O integration with IP CCTV. It supports proprietary protocols of several IP Video systems. No driver is necessary. HWg-Juno is simply an IP camera with many Digital Inputs & Outputs, without video stream. I/O integration is necessary to interconnect central IP Video monitoring system with other systems (security & fire system, Access control system, HVAC, entrance gates, power systems). Reduce integration costs with HWg-Juno. 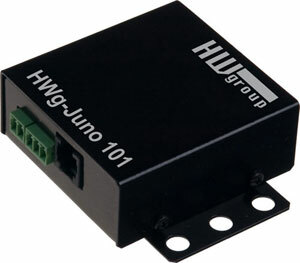 HWg-Juno is a hardware solution for plug & play I/O integration. HWg-Juno prevents software integration cost escalation. First public presentation of HWg-Juno is scheduled for the IFSEC 2010 exhibition (Birmingham UK), Hall 4, Stand G162. · HWg-Juno will be supported in IP CCTV you are using today. · HWg Juno provides predicable flat integration cost.